Today’s podcast is part 1 of my Services That Sell premium course that has taught countless individuals how to hit a four-figure monthly income. When I began building my business, I was still a full-time engineer. After working my day job, I’d be grinding until 3 am every night, yet it was bringing in virtually nothing. What I was doing just didn’t make sense. I was intent on creating complex sales funnels, getting potential customers to jump through hoops in order to eventually get to my $3,000 high ticket item. My low ticket, $10 offers weren’t solving my clients’ problems. They were merely putting band-aids on their bullet wounds. That’s when I decided to get rid of my low ticket offers and flip the funnel. Understand that what’s simple to you is someone else’s struggle. If you’re really passionate about solving a specific problem that other people have, then you may have found your signature service. Now we can really get started. If you’re truly ready to understand the power of a signature service then listen to the podcast on iTunes today. I also strongly urge you to subscribe so you don’t miss any of this free content that could help turn your business (and life) around. What is a signature service? – Instead of trying to create multiple products, a signature service is ONE offering that really makes a profound and meaningful difference in the life of your client. Because of this, you can charge a premium price. – Attract high caliber – When you command a high figure, you attract a high caliber of clientele. When someone makes a big investment, they truly commit and put in the work. On the other hand, when they make a small investment, they back it up with limited commitment. – Achieve your income goals – Let’s do the math. Imagine you have an income goal of $10,000 a month. Selling your service for $2,500 means you only have to land four clients. Selling a high ticket item helps you get to your income goal much quicker. – Only so much – You only have so much time and resources available. If you have just four clients per month, you’re going to have plenty of time to fully commit to providing them with the best service possible. 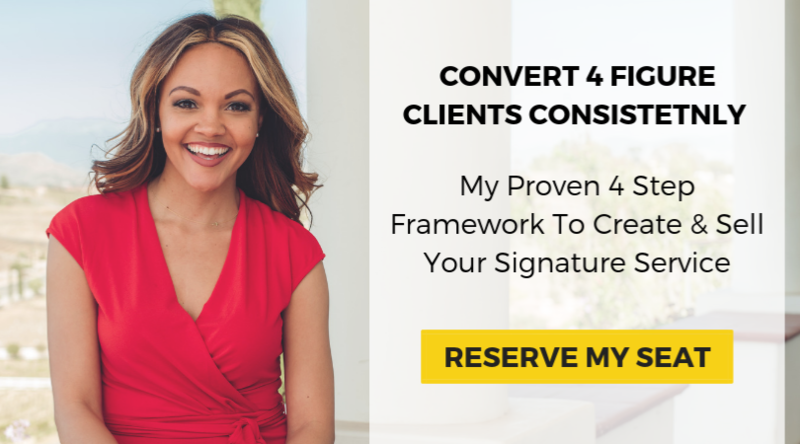 Can you handle four clients a month?… I thought so! – The most lucrative niches – If you want to sell a high ticket item, then the best three niches to operate in are: health, wealth and relationships. People are more willing to pay up if you’re solving their problems in these areas. – The right idea – To find the best business idea, start brainstorming. Here, you need to simply ask yourself, what problem am I solving? To do this, have a think about what problems you’ve solved in the past in return for money (or for free)? This episode was brought to you by my premium program Services that Sell. If you’ve been thinking about niching down and creating a four-figure service that you can sell consistently, And if you have been searching for a simple way to sell your services without a complicated funnel, I encourage you to sign up for my FREE masterclass at www.jereshiahawk.com/workshop. I’ll make sure you know everything you need to gain the clarity you crave to confidently sell your services online.